While the holiday season is a time of joy, it can also pose many dangers. Every year about 8,000 injuries occur from accidents related to holiday decorating activities. Christmas trees alone are involved in hundreds of fires which result in almost 40 deaths each year. Decorating with safety in mind can keep you from becoming one of those grim statistics. Select a tree that is as fresh and green as possible. The needles on a fresh tree will bend instead of breaking and should not fall off easily. Cut an inch or two off the bottom of the truck before putting it in a stand to allow water to soak into the tree. Use a stand that holds water, and keep it filled to prevent the tree from drying out. Locate your tree away from fireplaces, radiators, and space heaters. If an artificial tree comes with lights installed, look for the Underwriters Laboratory (UL) seal of approval to indicate that the proper wiring was used. Select only lights that have been tested by a reputable testing lab (such as UL approved) to be sure they conform to safety standards. Keep in mind that even approved lights can become unsafe if they are used improperly or have been damaged. Check each strand for broken bulbs, cracked sockets or frayed wires. If damage is apparent, discard the lights. Always unplug lights when replacing bulbs. Do not link more than three strands of lights unless the instructions indicate it’s safe. Make sure extension cords are rated for the amount of load they will carry. Cords and light wires should not be warm to the touch. Don’t run cords under rugs or across open floors or doorways. Keep pets and small children away from cords and lights. Connect lights to a circuit that is protected with a Ground Fault Circuit Interrupter (GFCI), or use a cord or plug that has GFCI protection built into it. Avoid using metal fasteners (like nails or tacks) to secure outdoor lights. Instead use plastic clips, hooks, or insulated cable staples available at home centers and hardware stores. Be sure that lighting used outside is recommended for outdoor use. Turn off all lights before leaving home or going to bed. If a timer is used to turn lights off, make sure it is set correctly and working properly. Don’t leave lit fireplaces unattended, regardless of the time of year. Stockings and other combustible decorations, such as pine garlands, can present a serious fire hazard when a fireplace is being use, so be sure to remove them before starting a fire in the fireplace. Resist the urge to burn wrapping paper or pine boughs in the fireplace as their floating embers can escape your chimney and could ignite your roof or a neighboring roof. Make sure candles are firmly secured in sturdy, non-combustible holders that will not tip over. Keep candles well away from flammable decorations, especially pine garlands and other dry, natural arrangements. Check lit candles frequently to make sure they haven’t burned down too far. Do not use lit candles on or near Christmas trees. When using a stepladder, make sure all four legs are firmly on the ground, and don’t stand on the top step or on top of the stepladder. Position an extension ladder at a 75° angle or a 1 to 4 ratio of horizontal distance to vertical height of the ladder (1’ out for every 4’ in height). Use ladder pads on the end of extension ladders to prevent slipping. Use a nonconductive fiberglass or wooden ladder when working with electricity. Don’t attempt to hang lights outside or go on the roof after dark. Unplug lights and other electrical decorations when installing. Do not hang lights in the vicinity of power lines. Do not attempt to throw strings of lights into trees located near power lines. Fires result in 3,000 fatalities and 16,000 injuries a year, and are more prevalent around the holidays To increase your odds of preventing a fire and escaping safely, be sure your home has working smoke and carbon monoxide detectors on every floor, a fully charged fire extinguisher, and an escape ladder handy for two-story home. Also, remember to have your fireplace and chimney inspected regularly and cleaned as needed. Locate smoke alarms near or on the ceiling and away from corners in all major rooms of the house. Install carbon monoxide detectors in bedrooms and rooms with wood or gas fired appliances. Test alarms monthly and replace batteries at least once a year. Clean your alarms periodically by vacuuming out any dust that has accumulated or blowing it out using canned air. Sensors on smoke detectors can fail over time, so replace alarms after ten years of use. Purchase one or more multipurpose (ABC) dry chemical fire extinguishers for your home. They can be used on all three types of fires: combustible materials (wood, cloth, paper), flammable liquids (oil, gasoline, grease), and electrical fires. Be sure to keep one handy in the kitchen where you can easily find it when you need it, since kitchen fires are some of the most common. 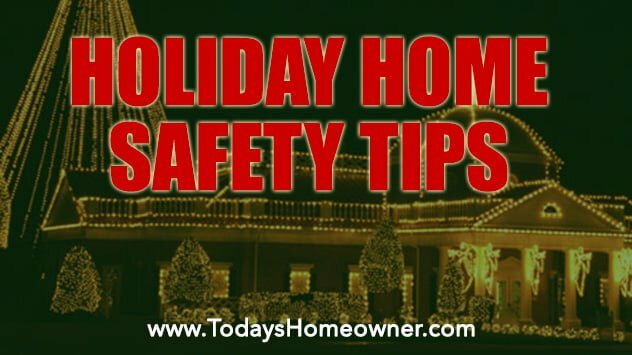 Taking these precautions will help ensure a safe and happy holiday season this year.